As every Scotsman knows, in 1314, at midsummer, the might of the English army came to grief in the boggy ground below Stirling Castle. Heroic charges were not enough; the packed infantry formations of the Scots triumphed. The King of Scots, Robert Bruce, had not wanted to risk battle, but in May his brother Edward had reached a deal with the English garrison of Stirling. The deal was that the castle would be surrendered, unless it was relieved by an English army before midsummer. The challenge was one which even the worthless English king, Edward II, could not ignore. Both sides knew that the battle would be fought close to Stirling Castle. Recruited at short notice, the English army was formidable, probably consisting of up to 3,000 cavalry and some 10,000 infantry. Scottish numbers are hard to estimate, but between 7,000 and 10,000 men seems reasonable. There were two days of fighting at Bannockburn – extraordinary in an age when most battles lasted a few hours. 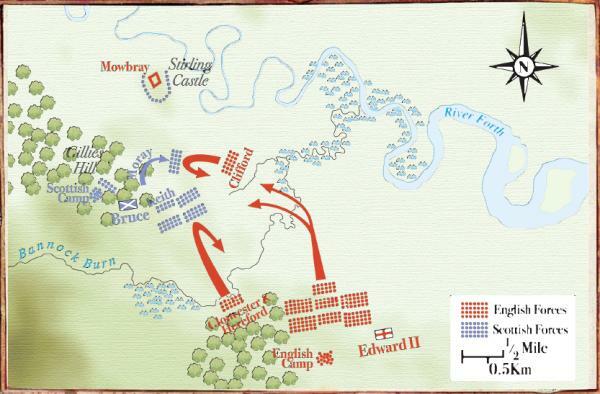 On the first day, a force of English cavalry under Robert Clifford rode towards the castle, but was engaged by a Scottish force under Thomas Randolf, and forced to withdraw. The main English army also advanced. Robert Bruce rode out ahead of his men, and defeated an English knight in single combat, using not a sword, but his favourite axe. The English withdrew, and prepared for the major conflict the next day. There were bitter arguments in the English camp. Two earls, Gloucester and Hereford, squabbled over who had the right to lead the vanguard. The night was uncomfortable; the boggy ground was cold and wet. In the morning, Robert Bruce knighted some his men, and then drew up his troops in a dense formation, known as a schiltrom. All knelt in prayer before the fighting began. The English charge could not break through the Scottish lines. The Scots had dug pits, which they then covered over, into which the horses began to tumble. Others reared and fell, impaled upon Scottish spears. When the Earl of Gloucester spurred his horse into the massed formation of the Scots, his men failed to follow him, and he was slain. The English archers, potential battle-winners, were scattered when Bruce ordered his reserve force of cavalry to attack them from the flank. That gave the Scottish archers free rein to cause havoc among the English cavalry. The melée was fierce, with the two sides locked together. The noise was horrendous, with men shouting, horses neighing, and metal clanging as swords and axes struck shields and armour. Gradually, the advantage went to the Scots, who ‘gave such blows with axes that they split heads and helmets’. The coats of arms on surcoats and shields were soon so stained with blood that it was impossible to make them out. In the closing stages of the battle, the English servants and camp-followers, who had been left to guard the baggage, made makeshift banners. They advanced, shouting, toward the fight to try to save the day, but the English army thought they were Scots, and began to pull back. The miserable English King was led off by the Earl of Pembroke to find safety; eventually, he reached the castle at Dunbar. Many of those who had survived the fighting were drowned in the Bannock Burn as they fled. helped badly with HOMEWORK thanks!!!!!!!!!!!!!!!! !